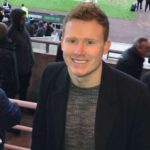 For all you Conor McGregor Bandwagoner’s out there, we at thesharpe.com have put together a definitive guide to yet another UFC event, and this time it’s the granddaddy of them all, UFC 205. Why has UFC 205 been so hyped? UFC 205 is easily one of the most anticipated UFC events of recent memory, if not of all time, and there are a couple of reasons for this. Conor McGregor is on the card, obviously! Let’s face it, the fact that ‘The Notorious One’ is on this card increases the entire event’s appeal one hundred-fold. Conor himself has said that fighters are “blessed” to feature on a preliminary card alongside him let alone on a main card, and it’s hard to argue with the Featherweight Champion; he’s just so damn entertaining, inside and outside of the Octagon! 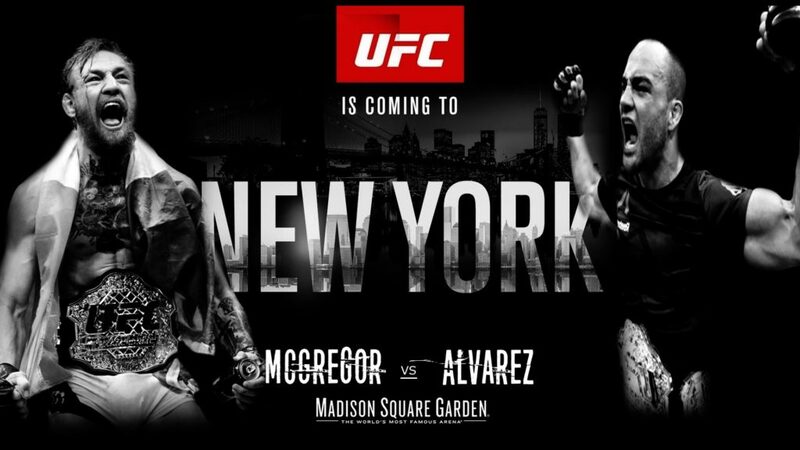 UFC 205 will be the first MMA event to be held in New York in over 20 years and to top things off it’ll be contested inside one of the most iconic sporting arenas in the world, Madison Square Garden. Decades before Las Vegas became known as the ‘fight capital of the world’, New York City held that distinction and Madison Square Garden was the Mecca, and on November 12th, MMA will get its chance to cement its place in the stadium’s illustrious fighting history. UFC 205 has already made giant strides towards doing this as, according to Dana White, it’s already broken Madison Square Garden’s highest-grossing gate record (i.e. how much gross revenue was generated via ticket sales) for a combat sport (a record which was held previously by a Lennox Lewis v Evander Holyfield fight back in ‘99). Conor aims to make history! It’s no secret that Conor McGregor is about two things; cashing cheques and winning belts and, at UFC 205, the Dublin man has the chance to do something that, in UFC history, has never been done before and that’s to be world UFC champion in two weight divisions. ‘Mystic Mac’ already accomplished this feat back in his Cage Warriors days and as Conor eluded to himself, if anyone can do it, he can. UFC 205 is set to be the first event since UFC 33, all the way back in 2001, where three UFC titles will be on the line. *Wipes drool from mouth* Not only do we have a ‘super fight’ between Conor McGregor and Eddie Alvarez for the Lightweight Title, but the Welterweight Champ, Tyron Woodley, who shocked the world by beating the seemingly indestructible Robbie Lawler at UFC 201, attempts to defend his newly acquired title for the first time against Stephen ‘Wonderboy’ Thompson. Last but not least, the girls are also in action as the current Strawweight Champion, Joanna Jedrzejczyk, will look to hold on to her belt when she faces her fellow Polish combatant, Karolina Kowalkiewicz. If a hattrick of title fights doesn’t float your MMA boat then the rest of the card is sure to. Chris Weidman will look to bounce back from the defeat he suffered at the hands of Luke Rockhold, as he faces the man-mountain Yeol Romero. The rumours that Donald ‘Cowboy’ Cerrone would fight Robbie Lawler at UFC 205 were ousted before they even had time to build momentum, so instead Cerrone, who looks as good a fighter as ever in his newly adopted 170 pound weight class, will face Kevin Gastelum, who’s fresh from his huge victory over former division champ, Johny Hendricks. The main card’s rounded off nicely with another battle of the females, as former Bantamweight Champion Meisha Tate will look to get over her defeat to Amanda Nunes at UFC 200 when she collides with Raquel ‘Rocky’ Pennington. So, where can I watch it? If you’re looking to find out more about where you can watch UFC 205, check out our last post here – The Conor McGregor Bandwagoner’s Guide To UFC 204! One of the UFC’s most enthralling factors is its sheer unpredictability. 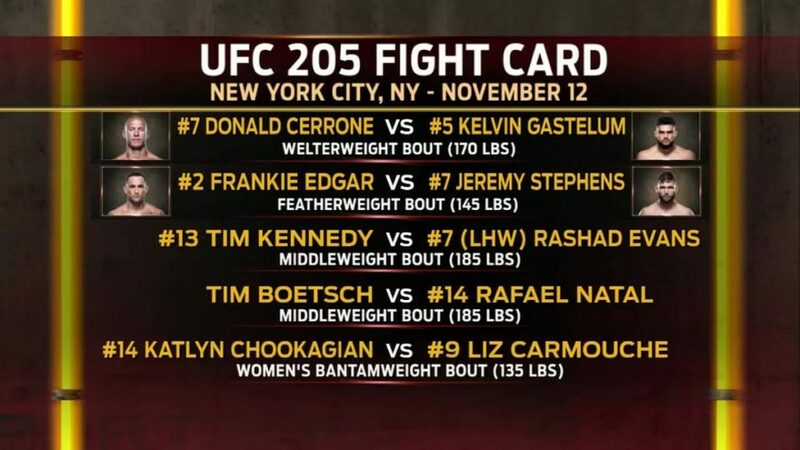 Big upsets have been a huge part of the UFC’s success throughout the years and what if, on November 12th at UFC 205, the ultimate upset were to transpire (not McGregor losing; that wouldn’t be grandiose enough)! What if all three titles were to change hands, interesting right!? Well, you’d better get in on the action, just in case it does happen. Conor McGregor, Stephen Thompson and Karolina Kowalkiewicz all to win is 8/1 with Paddy Power. Now, we hope you enjoy the fight and watch this space for our next ‘Conor McGregor Bandwagoner’s Guide…’! Lover of sports, lifter of weights, singer of songs and explorer of places.